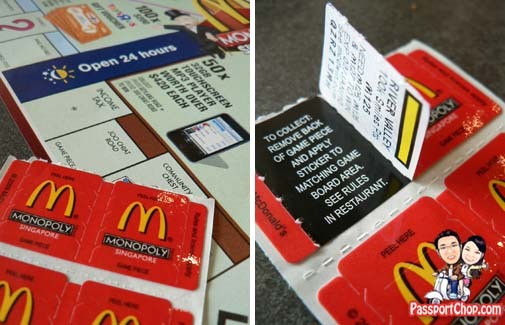 How to Improve Your Odds of Winning the McDonalds Monopoly Game? 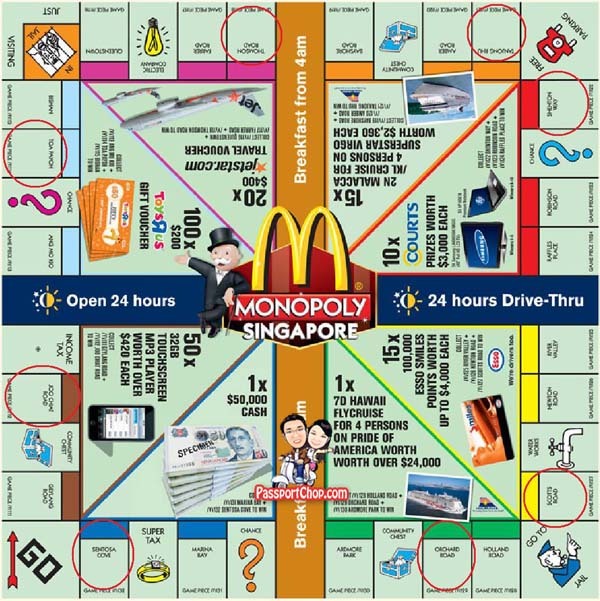 If you have not heard of all the craze behind the McDonald’s Monopoly Game in Singapore, you are either living in a cave for the past few weeks or is a tourist just passing through Singapore. If you are the latter, technically you are not eligible to win the amazing Collect-to-Win prizes. 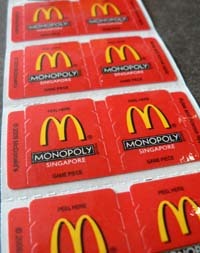 To play the Singapore McDonald’s Monopoly Game, simply buy any Extra Value Meal at any McDonald’s branch and you will be issued with game pieces (see picture below) which you peel to reveal either “Properties” or Instant-Win products e.g. burgers, fries, discounts at Toys ‘R” Us. The biggest prizes are the Collect-To-Win types. When you have collected all available “Properties” of the same color, you win the prize corresponding to the color. There is a whole range of prizes from Toy ‘R’ Us vouchers to a cool $50,000 prize (see gameboard below for details). Besides the above 212 Key Game Pieces, according to the McDonald’s Monopoly website, there are also about 2.2 million Instant-Win Game Pieces. McDonald’s claimed that there is a 1 in 4 chance of a Instant-Win prize, thus that means there will be a total of 2.2 million x 4 = > 8.8 million Game Pieces out there -> The odds of winning one of the Collect-to-Win prize is estimated to be about 1 in 38,000. Upsize your McDonald’s Extra Value Meals – Get 4 additional game pieces. Avoid McDonald’s Extra Value Breakfast Meals. You can’t upsize a Breakfast Meal to get the extra 4 game pieces. Don’t buy Student Meals or order through McDelivery – No game pieces for such orders. Buy McDonald’s Extra Value Meals during weekday lunchtime (12 noon to 3 pm) – with the ongoing promotion for McValue Lunch, you can upsize your meals and yet still pay less than if you buy a meal during other timings. Buy McDonald’s Extra Value Meal all around Singapore – Don’t confine yourself to one area especially the North. A recent (Nov 10) tweet from McDonald’s Twitter account mentioned “Seems like most of our winners are from the North. Time to restrategize?” This could mean a number of things – they are still in the position to shift around the game pieces? Related to the above point, spread out your purchases. If I was part of the team doing this McDonald’s campaign, I would have hatch up the evil plan of manipulating the game pieces such that the big prizes e.g. $50,000 and Hawaii Fly Cruise will be distributed nearer the deadline of 2 Jan 2010. This is based on the assumption that there could be a smaller number of McDonald’s meal purchases if most of the attractive prizes are already won. For ease of reference, you can print out the gameboard below. If you collected any of the game pieces circled in red, you are almost guaranteed of a win – the other pieces can be easily collected. Note that there is a printing error for the Game Piece: Geylang. 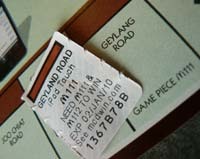 It is printed as Geyland and according to McDonald’s, the typo version is still acceptable. 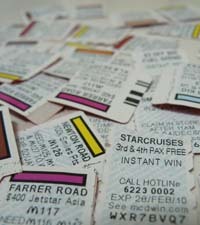 For updates on which of the Collect-To-Win prizes had been won, check out: http://www.mcdwin.com/winners/winners-01.html. I will go in with you to better our odds on the Mcdonalds Monopoly! I have 1 away on SEVERAL of the prizes!